As a number of people have said, for comedians and cartoonists Tony Abbott was the gift that just kept on giving. Perhaps my favourite cartoonist is The Guardian’s First Dog on the Moon. Thanks to Tony Abbott he’s had more material than he could cope with over the past two years. Now with Abbott gone I expect he will turn for inspiration towards the leader of the opposition party, Bill Shorten. Another subject that keeps on giving? 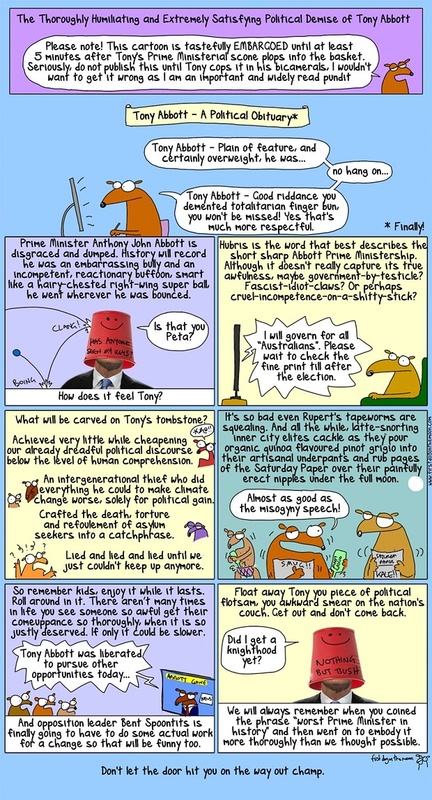 The cartoon below is one First Dog prepared earlier in the year when the first attempt to topple Abbott was announced. The coop failed, but the cartoon was resurrected for today’s edition of the paper following the overthrow of Abbott last night. It’s a terribly cruel cartoon, but one that manages to sum up the feelings of so many people. Am I wrong to laugh?